Julian Bowen has been supplying quality furniture at affordable prices for over 30 years and here at Terrys Bed Centre we are pleased to be able to offer all of their ranges at very competitive prices and with free delivery. 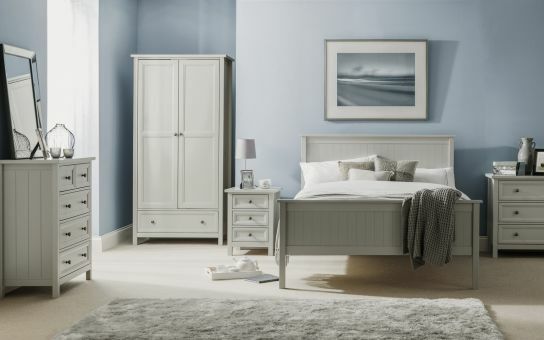 The Julian Bowen Maine dove grey bedroom is an elegant and extensive range of New England style bedroom furniture. The combination of exquisite dove grey lacquered finish with characteristic side panelling and detailed chamfered cabinetry makes for a soothing and refined aesthetic with timeless appeal. The Marlborough Oak bedroom range has a big collection of chests, wardrobes and dressing tables.It's made from solid American White Oak and Oak Veneers. With 30mm chunky tops, clean lines and panelled doors, Marlborough combines a solid oak frame construction and veneered panels with a sumptuous waxed finish. Drawers are constructed with Dovetail Joints and all chests and dressing tables are supplied assembled with only the wardrobes requiring assembly. The Julian Bowen Manhattan is a modern, ultra chic bedroom collection in stunning white high gloss lacquer with recessed handles enabling easy opening and creating a clean contemporary image. 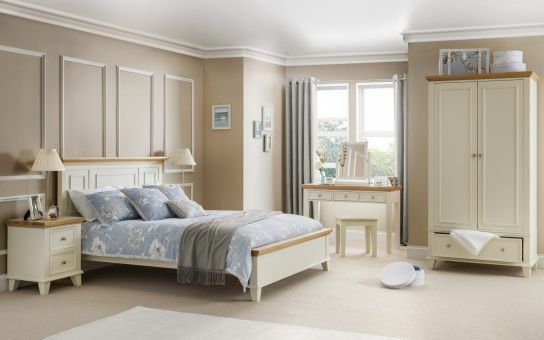 The Julian Bowen Portland range combines classic elegant design with a modern two tone finish offering a timeless style that complements both contemporary and more traditional bedrooms. I has a stone white painted finish, capped with a chunky solid wood Oak finished top and contemporary satin finish metal knobs.